Toxicology Branch works with public and medical communities, as well as other agencies to examine whether and how exposure to environmental factors (e.g., toxic materials, noise, dust, heat, mold) where people live, work, learn, and play may harm the public's health. Toxicological support is provided to assist other agencies or organizations by providing answers to questions such as home use of various chemical products, private wells, or unintentional spills. In addition, local environmental assessments enable volunteers and local public and private entities to identify hazards and resources to protect and preserve public health. To view statewide water quality information and maps on current sewage spills, treated sewage discharge points, fish consumption advisory locations, and coastal beach monitoring, visit the Alabama Department of Environmental Management or (334) 271-7700. ADPH resources on fish consumption advisories and coastal conditions are below. 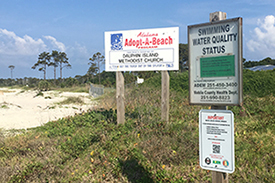 Coastal Conditions provides Alabama's information on beach-related advisories, food, air, and water. Fish Consumption Advisories offers information about fish from Alabama rivers lakes that may be contaminated. This information enables people to make informed choices about which and how much fish to eat. Seafood Testing Results give you the latest testing data on finfish, shrimp, crab, and oyster. Alabama Hazardous Waste Sites are assessed to inform communities about the risk of illness from toxic exposure or injury from physical hazards at the site. Communities receive advice on how to prevent or minimize exposures to potentially toxic materials. The Glossary describes the vocabulary and concepts used in environmental health information. Please visit Adult Blood Lead Epidemiology and Surveillance (ABLES) for information on lead exposure. For more information on environmentally friendly topics, please visit our Go Green page. The following documents provide further information on perfluorinated compounds and recommended actions for drinking water systems. Please read these fact sheets carefully before contacting the Health Department. They will answer many frequently asked questions about these compounds and their impact.